For the person losing their faith, this is for you. For the person who is mourning, this is for you. For the average joe, this is for you too. A few posts back, I wrote about a friend who passed in a car accident. Since, I have gone to his memorial service, mourned with friends, reminisced good times, and finally gained closure. I’ve asked God often “why Eric?” I also asked Him to give me some sort of sign that Eric is okay. Of course I fully believe Eric is in Heaven worshipping His Savior, but I to gain some sanity I kept asking God for signs. To you, the following may sound silly, but to me this is how God showed me a sign. I went to my first rangers game tonight. Earlier in the day was Eric’s funeral, so my heart had been very far removed from a loud baseball game, nonetheless, I went. Part of me was going with Eric on my mind because he LOVED the rangers, but part of me was slightly excited to partake in my first game. About 10 minutes into the game, a family came by, realized their seats were on the same row as me and decided to sit in the empty seats directly in front of us until the seat owners showed up (which ended up being 5 minutes later…). One of them was a kid no older than 10 with a light blue jersey for some select-sports team. In large letters it read “Harrison” on the back (that’s Eric’s last name). It took me less than 5 seconds to read it and connect it to the request I had sent God earlier today, yesterday, and the day before. 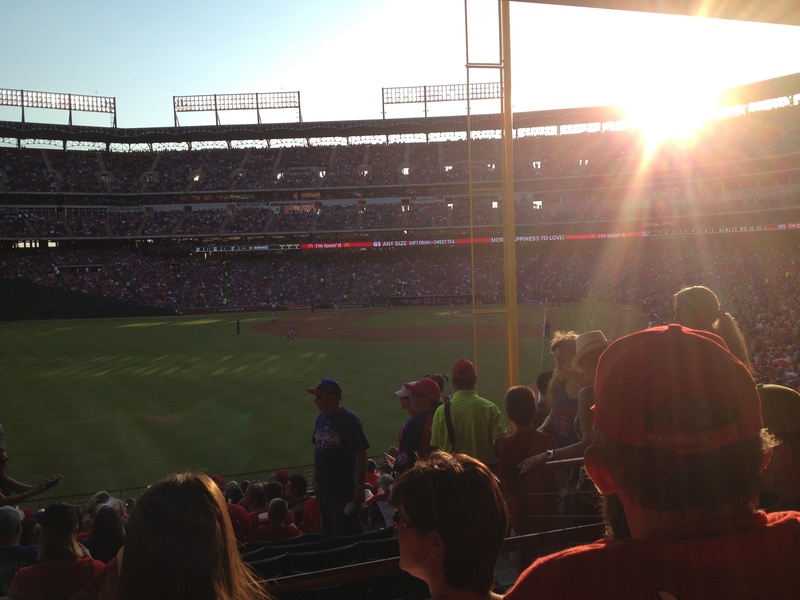 After a Rangers win, I couldn’t help but think that Eric was shining down on us. He was rejoicing and celebrating in Heaven. He was okay. God gave me a sign that meant Eric was still with us in Spirt, looking over us, sitting right in front of us, next to us, behind us. All we have to do is believe it. I guess you could say that was all a coincidence. But I can’t convince myself of that. The fact that this kid had a jersey with that name on it, decided to wear it TODAY, sat in empty seats FIVE minutes before the real owners came, and happened to be right next to me out of 44,000 people? Yeah, tell me it’s all a coincidence now.